You can count on the dealer to stand on all 17s in Power Blackjack. You may split any pair, and you may also re-split. Split aces receive one card, and tens dealt on split aces count as 21. Doubling down is allowed on any cards, even after a split. Insurance bets are available, but surrender is not offered. Two special rules exist in Power Blackack. A Power Split is available if your first two cards total 15 or 16 and neither card is an ace. A Power Double is available on an initial 9, 10, or 11 – you are shown a double down card, and if you don’t like it, you can click to draw again! The trade-off for these two rules is that dealer’s 22 pushes your bet. Your initial wager for a hand in Power Blackjack must be at least €/£1 but no more than €/£1,000. Bets are made with chips, which come in five denominations: 1, 5, 25, 100, and 500. When you win, the payouts are standard for the game. Blackjack pays at 3:2. Insurance pays at 2:1. Standard wins all pay even money at 1:1. Ties and dealer 22 always push. If you like special effects in your games, then Power Blackjack will knock your socks off! When Power Split or Power Double are enabled, your cards become electric, and lightning shoots around the screen. WagerWorks is known for fancy effects like these, and you’ll find more if you dig around and play the game for a while. If they slow things down for you because of a slow internet connection, just reduce the graphics quality and your game will run smoothly. Use the Power Split and Power Double options whenever they are available. While they make Dealer 22 push, this isn’t necessarily bad – it just means you get your bet back, and you have lost nothing. It does mean that you will win slightly less often, but that reduction in your odds is more than offset by the benefit you gain from using these Power options. 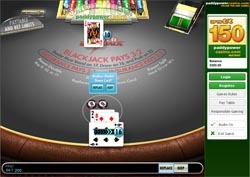 Power Split is a unique Blackjack game that offers some exciting new ways to get ahead. Of course, as with any new twist on blackjack, new players should initially play for free, until they can build up a suitable strategy. WagerWorks built in a trade-off for these new features – push on Dealer 22 – but we think the Power Split and Power Double provide the player with such a big edge, the sacrifice is more than worth it. Oh, and the game looks great too!